What is Let M Sweat for Hypohidrosis? Who is Let M Sweat for Hypohidrosis for? 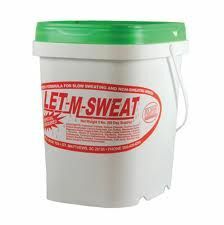 How is Let M Sweat for Hypohidrosis used? Use one ounce of Let M Sweat per day until cold weather arrives. Scoop enclosed. How does Let M Sweat for Hypohidrosis work? The LET-M-SWEAT supplement provides a particular combination of nutrients and ingredients that aid your horse in battling non-sweating anhidrosis. 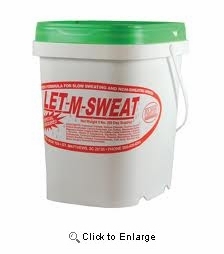 The LET M SWEAT horse supplement helps most non-sweating horses to break out in a sweat. Plus, it also aids in preventing borderline cases from developing into non-sweaters. How much Let M Sweat for Hypohidrosis do I get?